An immensely affordable multimedia handset from Nokia is soon going to launch in India in the festive season. 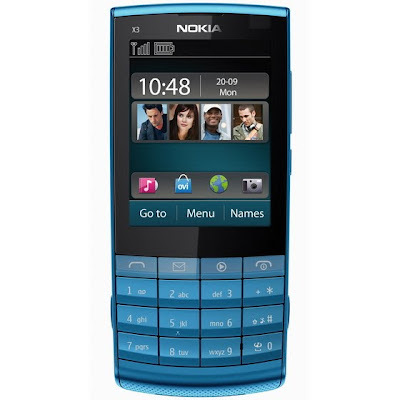 Called as Nokia X3 Touch and Type or simply Nokia X3-02 will cost its buyers just Rs.7500. The handset is touchscreen type and comes with a normal alphanumeric keypad with 12 rows. A 2.4” touchscreen in a music-oriented handset is a cool thing. The phone is also sleek and measures just 9.6mm in width. Nokia X3 02 is also light in weight with 78 grams. The specialized features of X3 02 includes handwriting recognition. For music lovers, Nokia X3 02 incorporates a FM radio with RDS and a music player. It’s dedicated music keys ease the operation of the handset while listening to music. There is in-built 5 MP camera in Nokia X3 02 which supports 4x digital zoom. It captures videos quite easily. Ovi Music Unlimited can be accessed in some countries on X3 02 for download of music. The Nokia X3 02 is a 3G handset which sports most advanced connectivity features as Wi-Fi, microUSB 2.0 & Bluetooth. It works on quad band GSM network. For data storage, the memory of Nokia X3 02 is expandable to an upper limit of 16GB via a microSD memory card slot. Nokia X3 Touch &Type has a robust battery that offers talk time of 5 hours and can remain in standby mode for upto 17 days. Nokia X3 02 supports all major messaging features and has dedicated keys on keypad for it. Similarly, all the social networking platforms will also be covered on the handset including Facebook and Twitter. T&T is pre-loaded with three chat messengers viz. Windows Live, Yahoo and Gmail. 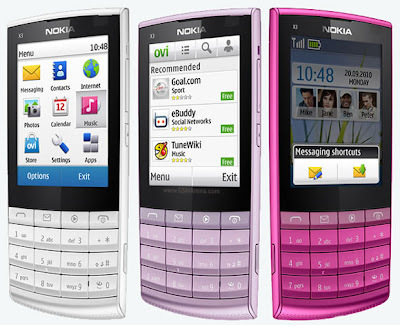 The X series of Nokia has brought may other spectacular Nokia devices earlier as Nokia X2, Nokia X6 and Nokia X9. This mid range phone will follow the suit and it will come in brushed aluminium finish and will be launched in five beautiful colors viz. White Silver, Dark Metal, Petrol Blue, Pink and Lilac.